Add some sizzle to your garden, porch or outdoor oasis with this gorgeous Gold Sun Wall Decor from GardenFun! 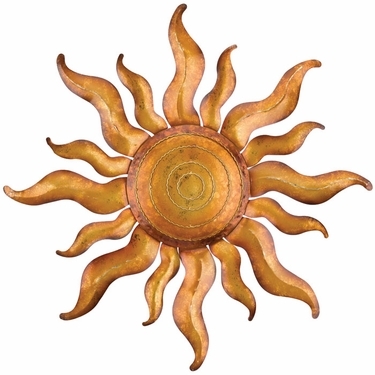 This beautiful metal sun brings to mind ancient Greco-Roman style to spice up any space. Measuring 21 inches by 21 inches at its widest points, this beautiful sun wall art is ideal for outdoor display. With a symmetrical design that's sure to garner attention as the centerpiece of your outdoor decor, our Gold Sun Wall Decor is the ultimate addition to your space. Whether you're beautifying your deck or you'd like to add a focal point to your fence, garden or wall, this sun will do the trick. GardenFun is the perfect place to find fabulous outdoor art, including this gorgeous sun and so much more!